Mount Bromo Midnight Tour Packages is is one of Mount Bromo Tour Package to enjoy Bromo Sunrise, Crater and Mount Semeru (the highest mount in East Java Province). This tour package is the simple vacation, only need one day and one night duration, Some visitors choose this Midnight tour when they have not much time for other tourism objects. Bromo Tour Midnight Package is possible started from Surabaya City or Hotel, Malang and Banyuwangi Ketapang Harbor depend on the visitors arrival. Mount Bromo Midnight mostly preferred by visitors because it is quite practical and without requiring Hotel in Bromo Mountain area. Bromo Tour Organizer provide this tour package with special price and comfortable service for the costumer satisfaction, If you start from Surabaya Airport, You take the public or private taxi to Mt Bromo direction with duration 3,5 hours driving through Lumbang and Sukapura District to Cemoro Lawang, Ngadisari village, or you can take the private tour pacakge to Travel Agency around Java Island in order your holiday more relax with an organized tour. 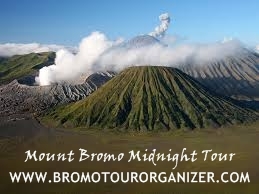 For detail itinerary about Mount Bromo Midnight Tour Packages, You can read below. After get Cemoro Lawang or Sukapura, change your car into the Jeep 4 WD then start Mount Bromo Tour at 02.00 AM to Mount Panajakan or view point for 1 hour driving to the parking lot. After get Mount Bromo crater, enjoy your time until finish then comeback to the jeep to continue your trip to Savana hill and whispering sand or directly comeback to Surabaya airport or hotel. If you are interested to make holiday for Mount Bromo Midnight Tour Packages, You can visit Our contact to get detail information about tour package price, Jeep rental, booking tour and other facilities. Semeru Trekking Tour | Mount BromoTour | Ijen Crater Tour Packages 5 Days are combinations tour Packages which we offer you to visit the popular volcanoes in east java. this tour package is very interested by tourist, and to be favorites destination not only domestic but also foreigner. Mount Semeru (Mahameru) also known as Mahameru is volcano which still active and is the highest peak in the island of Java. The height of the peak of Mount Semeru, 3,676 meters above sea level (mdpl), Mount Bromo is a active volcano having a vast sea of sand and bromo crater that exotic located and also very famous with the beautifull sunrise. Ijen crater is a crater lake which is acidic at the top of Mount Ijen 2,443 meters high above sea level with a depth of 200 meters and a broad Lake crater reached 5,466 hectares. 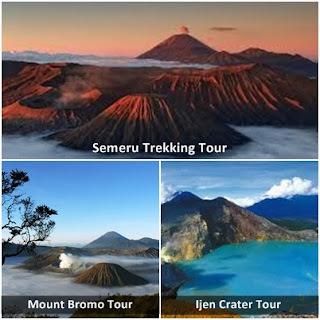 Semeru Trekking Mount Bromo Ijen Crater Tour Package have duration trip 5 days And 4 Nights, This tour started from Surabaya, Malang, Banyuwangi Ketapang Harbour Hotel, train station or airport. After having breakfast Semeru Trekking Tour will start with hikking to Ranu Kumbolo lake by 4 hours trek. Ranu kumbolo is the beautiful lake and very natural place for break. Wake up in the dark night at 00.00, semeru trekkking tour begin with hike to Mt Mahameru with duration 5 hours hard trekking. You have to be careful due the landslide common happen in these area, so make sure that you have a strong torch to light your path. The route to the summit quite straightforward, in the sandy loose ground will again test your stamina. Day 04: Mount Bromo Tour - ijen crater. Mount bromo tour start On 3.00 am in the morning, you will be picked up by Jeep from your hotels, villas, or homestay to view point at the top Pananjakan 1, the tallest view point on the edge of the Tengger caldera to see and enjoy the beauty of the sunrise with volcano of Mt. Bromo and Mount Semeru as backround. About at 08:00 am, Touring in mount Bromo tour is done and back to hotel for breakfast, take shower, packing, loading bags, and chek out. After you get your arrival location, Semeru Trekking tour , Mount Bromo tour, Ijen Crater Tour Package 5 Days finish. You can contact us For more detail information about Semeru Trekking Mount Bromo Ijen Crater Tour Packages 5 Days price, accommodation and trekking facility, or Bromo Tour organizer. Get surabaya airport or hotels then Semeru Trekking Tour Packages 4 Days finish. 1 Night hotel in Ranu pane . 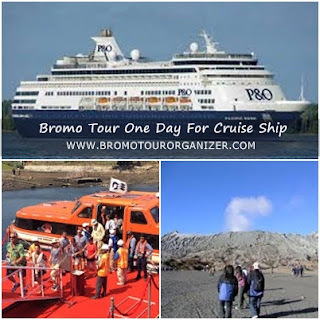 Bromo Tour One Day For Cruise Ship From Probolinggo Port, is tour packages to explore the beauty of Mount Bromo and City Tour Probolinggo, which is that needed a duration trip 1 day, Bromo Tour Package one day is a short tour to spend time in probolinggo, especially for passenger who visit probolinggo city from probolinggo port by used cruise ship. Bromo Tour One Day not only to enjoy mount bromo, bromo crater, sea of sand, but also possible to enjoy the beauty of madakaripura waterfall (if time permit), and the last tour packages program is probolinggo city tour by visiting places such as the Red Church (gereja Merah), Museum of Probolinggo, traditional market (pasar Baru), Central handicraft Batik, and Tri-Dharma Temple. For detailed information about Bromo Tour One Day for Cruise Ship please see the itinerary below. 08.00 – 09.00 Our team will pick you up using private cars from probolinggo port, then straight to Mt. Bromo. 13.15 – 15.00 Explore city tour Probolinggo. 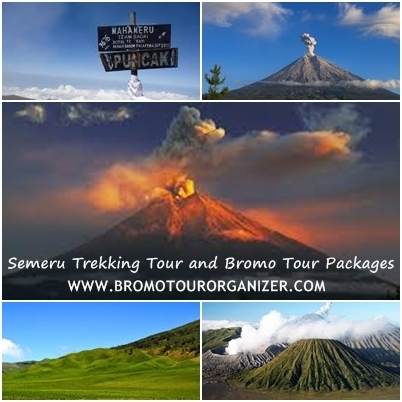 Semeru Trekking Bromo Tour Packages. 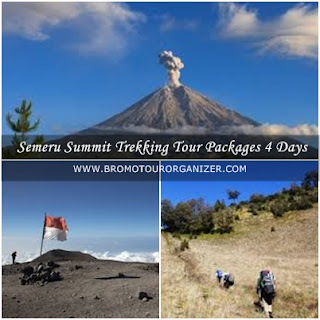 Semeru Trekking Bromo Tour Packages 4 Days 3 Nights are a combination tour package to visit between bromo tour package and mount semeru trekking tour. both the mountain in east java, and also become a favorite destinations for tourists both foreign and domestic. Mount Semeru is an active volcano located in East Java, Indonesia. It is the highest mountain on the island of Java. This stratovolcano is also known as Mahameru, meaning 'The Great Mountain' The name derived from the Hindu-Buddhist mythical mountain of Meru or Sumeru, the abode of gods. 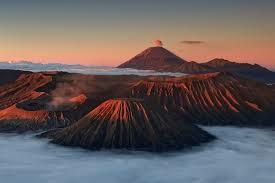 Bromo is very famous with the beautiful view sunrise when viewed from view point in mount penanjakan. Mt Bromo sits in the middle of a plain called the "Sea of Sand" (Javanese: Segara Wedi or Indonesian: Lautan Pasir), ijen also have the amazing beauty that name is a blue fire that is very popular not only in indonesia but also in the world. Mount Semeru Trekking Tour and Bromo Tour Package have duration 4 days 3 nights, you can start trip from malang, surabaya, or banyuwangi via ketapang harbor. 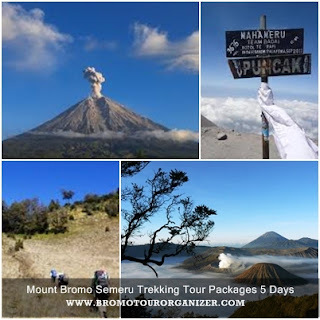 Detail itinerary of mount Semeru Trekking Tour and Mount Bromo tour packages from Surabaya, Malang, Jojakarta and Banyuwangi Ketapang Harbour. we will overnight in Malang City or in Tumpang Village. After get ranu pane submit medical check entrance fee and start to trekking for 10 km or 4 hours to ranu kumbolo with your porter have rented before. 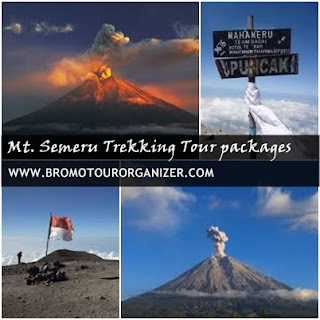 Mount Semeru Trekking Tour, bromo tour packages 4 days are finish the tour. If you interest to enjoy Mount Semeru Trekking Tour and Bromo Tour Package 4 Days you can discussdetail information about the price of Semeru Summit Trekking and bromo tour package, accomodation or the other facility. please contact us.